Cecil Buffington ~ Making a point . 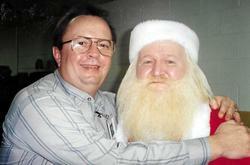 . .
On the left is Warren Schuler ~ Our Dillon Quality Assurance Manager and my best friend during my Dillon Stay. The beautiful Dillon South Carolina processing plant. 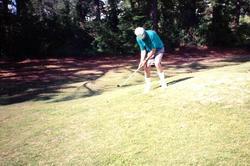 When I went to Dillon, no one played golf. 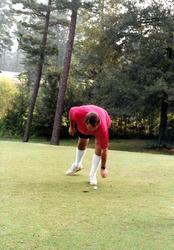 When I moved to Dothan, virtually all the Dillon management staff played golf. 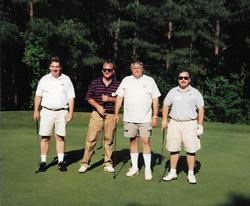 On the left in this picture is ( far left ) Tom Hundley. I brought Tom in from Harrison Poultry in Georgia. One of the best supervisors I have ever had the priviledge of working with. 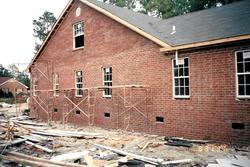 Building the new Buffington house in Dillon, South Carolina. 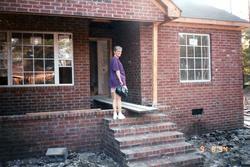 Betty Buffington looks over her new home to be in Dillon, South Carolina in 1991. 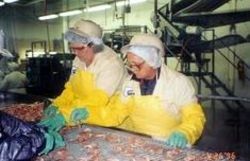 Escaping the pressures of USDA, EPA, City poiltics, union organization efforts and alot of other daily pressures in the poultry environment. 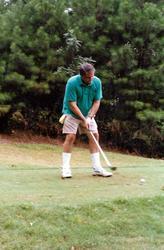 Golf has always been a way of life for Cecil Buffington. 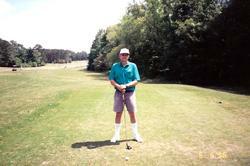 Cecil Buffington joined the Trent Jones Golf Club in Dothan, Alabama and played on most weekends. Some of the Perdue Managerial Awards I received at Dothan. Sometimes I played 9 holes after work. Golf was my favorite pressure relief valve. 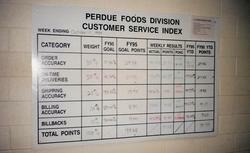 At Perdue we charted everything. Every stat was carefully analyzed and improvements sought. Looking over the new 60 foot debone cone lines at Dothan. The Cantrell people did a great job getting the equipment in for our big bird deboning changeover. 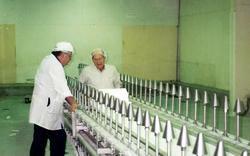 One of our 60 foot cone lines at Dothan. 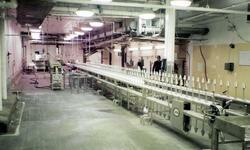 We would eventually have four lines in the back of the plant. 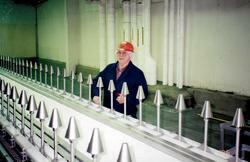 Mr. Perdue checks out out deboming line at Dothan in 1995. Mycom drum stick deboners were used to debone drumsticks. 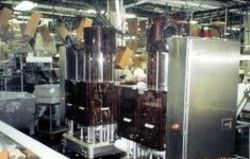 These machines cost $220.000 each. We had two in the plant. 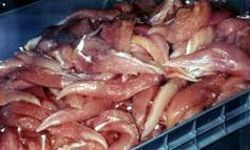 Some beautiful breast tenders from our Perdue Dothan operation. Mr. Perdue looks over one of our 9 pounds roasters at the Dothan plant. We grew the largest bird in the United States for our total plant deboning operation. 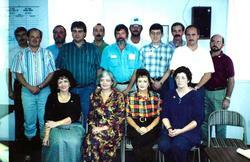 Another Quality Improvement Training Class in Dothan. 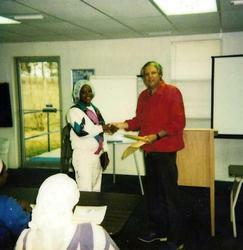 Cecil Buffington personally taught all staff members the Quality Improvement Training Program. 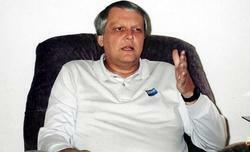 Buffington was a certified Train-The-Trainer including all the Dale Carnegie programs. Cecil Buffington Dothan directs go through the Quality Improvement and Dale Carnegie Course taught by their Division Manager and leader. New flag pole installed at the Dothan Processing plant upon Cecil Buffington's arrival in Dothan. The Dothan High School ROTC presented the colors and raised the US and Perdue flag at the Dothan Plant. Flags being raised on a beautiful day in Dothan, Alabama. A US Flag and Perdue Flag now flying high in Dothan, Alabama. 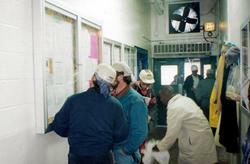 Associates paid particular attention to bulletin board announcements at the Dothan Plant. 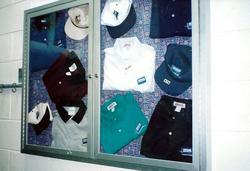 Perdue caps and shirts were on display for sale at the Dothan plant. Just about all management wore Perdue shirts at work. Mrs. Mary Lloyd ~ The best Division Secretary to ever work in the poultry industry. She kept the Dothan operation operating at full administration strength. Cecil Buffington presents a service award to a deserving Perdue associate. 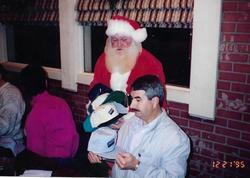 Snata Claus passes out Perdue caps to all guests at a Perdue Christmas Dinner in 1995. 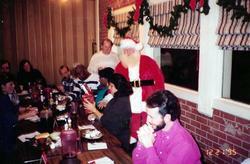 Personnel Manager Ray Chasman gives our Perdue Santa a big hug during a Perdue Dixie Christmas..
A Perdue Christmas dinner in 1995. 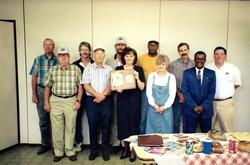 Christmas gifts for the Perdue management staff in 1995. 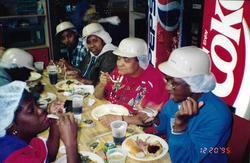 More associates enjoying their Christmas dinner in 1995. 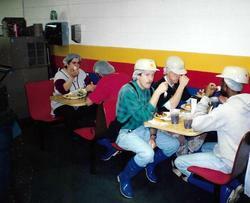 Processing Plant associates enjoy a Christmas dinner in 1995 in the Perdue processing plant break room. Making Perdue chicken winners from debone carcasses. 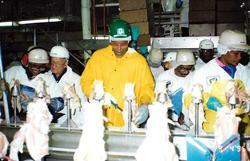 Perdue associates working on the IQF ( individual quick Frozen ) line at the Dothan plant. 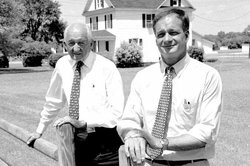 Without a doubt, the greatest high-lite of my 42 years in the poultry industry was working with Frank and Jim Perdue. They were more like friends than employers. Great people in a great business. It was a great thrill to wear the Perdue logo to work every day.